Ella Bache Hydra Revitalising Fluid Cream is a plumping and revitalising moisturiser that feels fresh and soft on the skin, perfect for combination skin types. 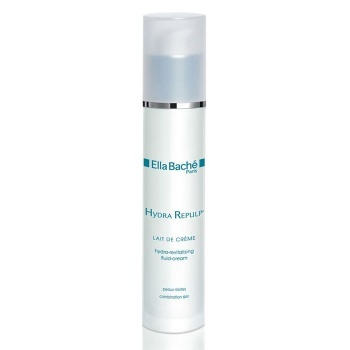 Ella Bache Hydra Revitalising Fluid Cream is as light as a fluid and as quenching and comfortable as a cream that replenishes the skin leaving a soft to touch with a mattifying powder left behind for comfort all day long. Ella Bache Hydra Revitalising Fluid Cream contains grape vine flower to prevent skin ageing and revitalise the complexion, whilst sesame oil stops water loss and macadamia nut oil quenches without residue.